What: Reception, Live & Silent Auction, Raffle, Balloon Pop,Fenway Fare (Hotdogs, sausages, chicken and more...) and lots of great fun at the historic Fenway Park. Philip Stein Limited Edition 25th Anniversary ‘Oprah’ Watch from Oprah’s Ultimate Favorite Give Away Show. 1st Annual Dream Big! Sports Gala & Auction is a Great Success! 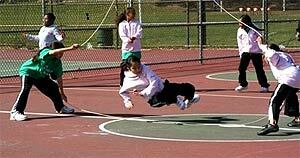 Chris Carleton, John Gallant, Linda Driscoll, Angela Hucles and Bridget Belgiovine join the Double Dutch Team “The Best from Boston”. Photos left: (L) Attendees enjoying event, (R)Coach Mara Schanfield is joined by her Excel H.S. basketball team members: Marika Thompson, Niyema Boseman and Lashonda Rivera at the Winter Wonderfest. On January 7th, 2011, the Dream Big! 1st Annual Sports Gala & Launch took place at the Westin Waltham. Over 135 individuals attended the event and joined auctioneer John Terrio in a fun filled evening. The evening’s festivities consisted of a raffle, silent & live auction, dinner and a wonderful Double Dutch demonstration by The Best from Beantown. Welcoming the attendees was: Angela Hucles, President of the Board of Directors, Linda Driscoll, Founder & CEO and Niyema Boseman, Captain of the Excel High School Basketball Team. A very special thank you to the Dream Big! Board of Directors and National Advisory Board Members, our Sponsors, Auction Donors, Volunteers and Attendees who contributed to the success of this wonderful event! Read more about 1st Annual Dream Big! Sports Gala & Auction is a Great Success! In an effort to combat the alarming physical and psychological health risks affecting young girls, Linda Driscoll, a non-profit and sports management professional for the past 25 years, launched Dream Big! in Massachusetts in 2010. The goal of Dream Big!, a 501(c)3 charitable organization, is to ensure that all girls, regardless of socio-economic background, have the equipment, athletic footwear, sports attire, program fees, training expenses and supplies that they need to participate in sports and physical activities that contribute to their overall health, fitness, education and well-being. 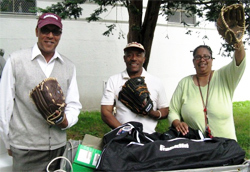 BPS Athletic Department Staff, (L to R) Wallace Johnson, Kenneth Still and Darlene Knight show off new softball gloves. Dream Big! donates softball equipment to support the first ever Boston Public Schools Softball Feeder Program for middle school girls. The donation of equipment (gloves, batting T's, bats, softballs, pitching returns etc...) for the girls softball clinic was donated to Boston Public Schools (BPS) Athletic Department. This clinic will serve as the first of many middle school clinics in the development of a feeder program for BPS high school athletics. Coming your way this month Dream Big! 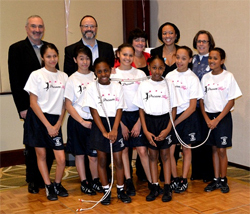 will collaborate with several youth sports organizations in the Boston area to pilot a Boston Public Schools Double Dutch league for over 200 middle school girls known as Jump Boston!. The following nine middle schools in the pilot program will receive funding for coaches, uniforms, and tournament participation: Higginson-Lewis, Irving Middle School, Mildred Ave, O’Bryant, Murphy, Young Achievers, Orchard Gardens, Gavin and Dearborn Middle Schools. Read more about Jump Boston! 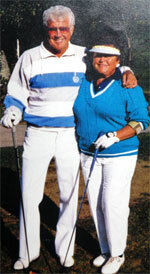 Robert and Frances Driscoll of Wellfleet, MA partner with Dream Big! to get girls involved in sports and physical activity by donating the funds to underwrite the cost of a web site for Dream Big!. “Sports inspires a competitive nature, teaches good sportsmanship and helps children adopt a healthy, active lifestyle,” says Robert F. Driscoll. The web site will enable Dream Big! the opportunity to reach out to more girls in need throughout Massachusetts while connecting community members and businesses that can provide the needed resources to get girls physically active. Franklin Sports Partners With Dream Big! to Get Girls Moving! Special thanks to Franklin Sports for their very generous donation of softball gloves, bats, balls and other equipment to Dream Big! to help create new opportunities for girls to train and compete in the sport of softball. 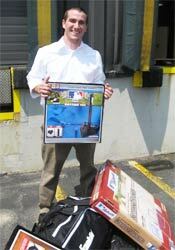 Photo Left: Mike Lyden from Franklin Sports donates much needed softball equipment to Dream Big!. The equipment was used to fill the Dream Big! Read more about Franklin Sports Partners With Dream Big! to Get Girls Moving! Sudbury Youth Soccer provides Dream Big! with soccer equipment that will impact over 500 girls throughout Greater Boston. 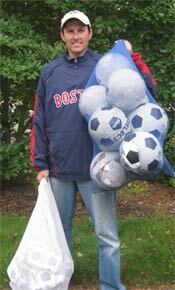 Photo Right: Chris McClure, Equipment Manager for Sudbury Youth Soccer, shows off a couple of the many bags of soccer balls, pinnies, cones and other equipment they donated to Dream Big! to help girls' soccer programs! Thank you so much to Chris and Sudbury Youth Soccer for this wonderful donation and for helping us give girls in need the opportunity to play soccer.